KALAMAZOO, MI – A weekend bicycling trip and an intolerance to soy protein sparked the creation of the KaraComet cookie bars, The DoughChicks’ most popular product, designed to fuel the body. 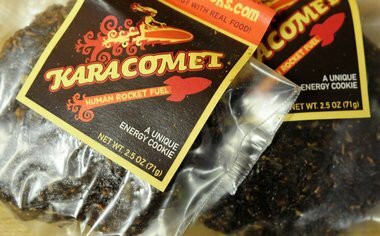 Don’t let the “cookie” part fool you, a KaraComet bar may taste sweet but it has enough nutrients to replace a meal, owner Denise Steely says. The result was a KaraComet energy bar. The high-protein, naturally sweetened no-bake cookie was created to meet the needs of people with food allergies, who want a healthy snack, the owners said. The 260-calorie cookie contains whole oats, raw nuts, flax seeds, figs, coconut and bittersweet chocolate. The energy bar usually costs about $3. The DoughChicks – Denise and her 29-year-old daughter, Kara – opened their small business in 2007 in Algoma, Wis. They relocated to Richland in 2008 and now are mixing and mashing granola and other local foods at the Can-Do Kitchen at the People’s Food Co-op of Kalamazoo. The Steelys are all about active and healthy lifestyles and often take weekend bicycling and motorcycling trips and participate in marathons. Denise said their passion for healthy eating drives their small business, KaraBread LLC. The DoughChicks also make agave nectar-sweetened Chia Crunch cereal and raw chocolate truffles called RawKet Bites, with the same healthy principals in mind. Denise said they are cooking up more gluten-free ideas for future products. The DoughChicks products can be found at People’s Food Co-op, Bronson Cafés, Sawall Natural Foods, Alfred E Bike, Natural Health Center, Beer and Skittles, Tudor House Tea & Spice, Tiffany’s Wine & Spirits and at Something Better Natural Foods and Apple Valley Natural Foods in Battle Creek.